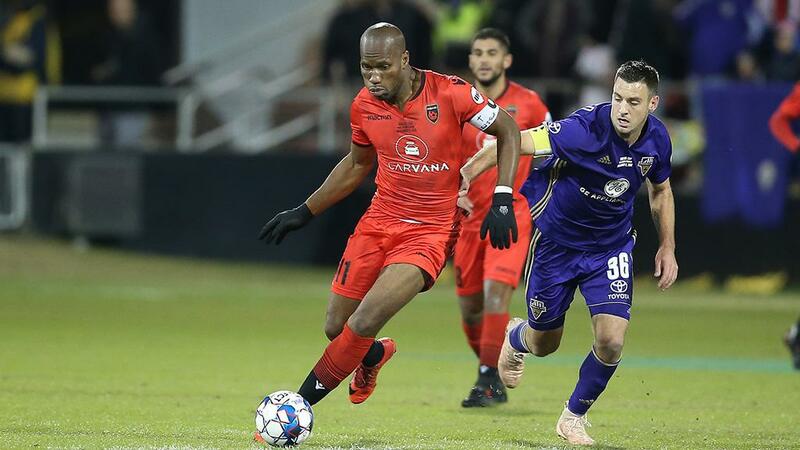 Legendary striker Didier Drogba confirmed on Wednesday he had called time on his playing career, with the 2018 USL Cup that saw his Phoenix Rising FC side square off against eventual champion Louisville City FC earlier this month serving as the official swansong to his remarkable run as a player. Speaking with the BBC World Service’s Sportshour, the 40-year-old – who scored 17 goals in 26 appearances for Rising FC, including three goals in the club’s run through the 2018 USL Cup Playoffs – said the final stop of his career had been a fulfilling way to give back to the game, which saw him claim the UEFA Champions League once and the English Premier League and F.A. Cup on four separate occasions apiece with Chelsea FC. A late-bloomer professionally, Drogba didn’t play top-flight soccer until the age of 23 years old with Ligue 1’s Guingamp. Over the next 13 years he won every trophy in England and helped Chelsea claim the Champions League in 2012, scoring the equalizer against Bayern Munich before the side took victory in a penalty shootout. He twice won the Premier League’s Golden Boot during his time with the London club. Drogba also played on three occasions in the FIFA World Cup, leading the Ivory Coast to the tournament for the first time in 2006. He retires as his country’s all-time leading scorer with 65 goals at the international level. In addition to his two seasons with Rising FC, Drogba also played for the Montreal Impact in Major League Soccer where he helped the side reach the 2015 Audi MLS Cup Playoffs. With Rising FC, he helped the side reach the USL Cup Playoffs in each of his two seasons with the club and scored four goals in five postseason contests.